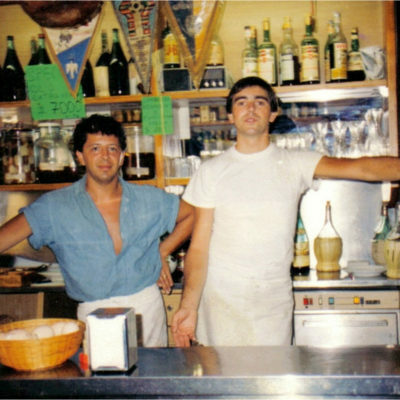 Entering the restaurant, it is hard not to notice the countertop laden with typical coldcuts, fruits and vegitables that are in season, and the famous florentine beef-steak. 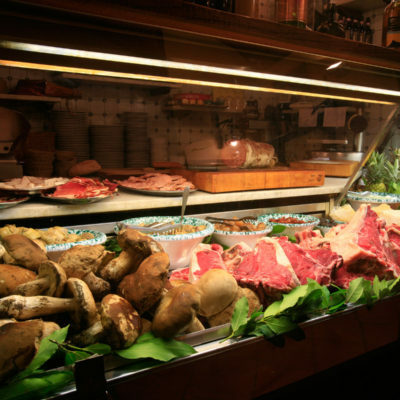 The cuisine is made up of typical and traditional tuscan recipies. You can enjoy excellent cold cuts and cheese appetizers, accompanied by delicious oil soaked snacks. 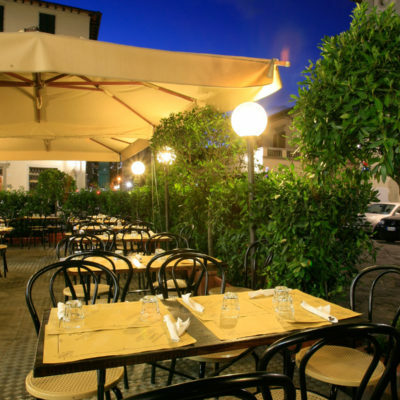 First courses include: ribollita (thick onion soup), potatoes with tomato sauce, tagliatelle with a creamy boar sauce, and penne with pumkin. Our menu is arranged on a daily basis, but you can always find tripe and lampredotto. Our main course dishes include fried brain, chicken with fried vegetables, and the exceptional florintine beef-steak. Highlights of our desserts are tiramisu, chocolate cake and a traditional oven honey with hot cream. The Cambi bar offers around one hundred varieties of wine labels, all from the tuscan region, and each bottle complimenting our variety of dishes. 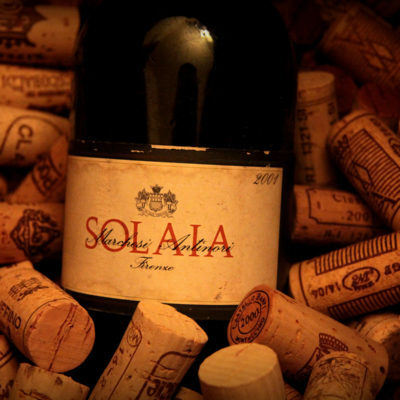 A sample of our wine list includes wines from Bolgheri (Masseto, Sassicaia, Ornellaia and Guado al Tasso), Super Tuscan wines (Il Tignanello and Il Solaia), and a dozen wine labels from the Brunello di Montalcino winery, including different years for Chianti Classico Riserva. We also have some local reds from Montalicino and Montepulciano. The food is obviously traditional tuscan home cooking. You can taste excellent hovres d’hoeur of salumi and cheese accompanied by deliciuos vegetables presrved in olive oil; among the first coursies, ribollita is certainly one of our top hits, pappa al pomodoro (tomato soup), boar tagliatelle and penne with Squash blossoms. Trippa (tripe)and lampredotto, always present in our daily menu, remind us we are in San Frediano, the heart of ancient Florence. 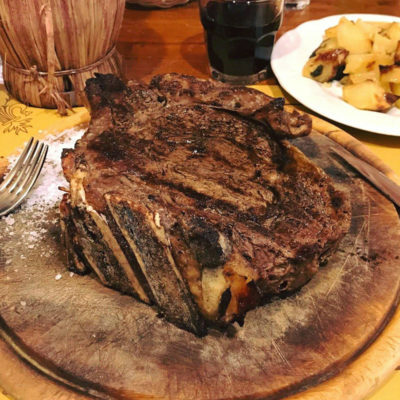 Fried brains, chicken with fried season vegetables and the exceptional bistecca alla fiorentina, one of the best for quality and taste, make this restaurant a must to visit when in Florence. Various tipical desserts also present like sfogliatina di mele with warm cream, tiramisù and the chocolate cake. In the summer, the garden can host up to 60 people; it faces piazza del Tiratoio from which you can see the chiesa di Cestello's dome. the halls are in a building which was previously a convent from the 5th century or probably older, later transformed in stables for noble florentine families. Numerous traces of this past remain: portraits, ancient objects and decorations. The furniture is warm and welcoming: food is served on wooden tables with paper napkins with wooden benches and stools for seats. Service is professional and friendly and the home like environment puts our clients at ease as thy were at home.